Dino Ciccarelli (born February 8, 1960 in Sarnia, Ontario) is a Canadian ?former professional hockey player who played 19 seasons in the National ?Hockey League, primarily with the Minnesota North Stars. He scored 1,200 ?points in his NHL career, and is the North Stars all-time leader in points. Dino Ciccarelli took the NHL by storm in his rookie season with the North ?Stars with a dominating performance in the 1981 Stanley Cup playoffs. 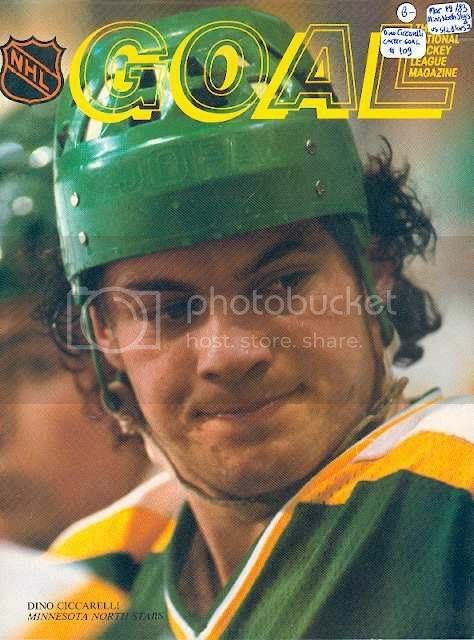 ?Ciccarelli played 32 regular season games that year but played a major role ?in the Minnesota North Stars surprising march to the Stanley Cup Final ?when he scored 14 goals and 21 points in 19 games. Ciccarelli built on his rookie success, scoring a career-high 106 points on the strength of 55 goals in his first full season. As a North Star Ciccarelli not only developed into a consistent goal-scoring force, but he quickly established a reputation as a gritty, aggravating forward scoring the bulk of his goals from the top of the crease, and usually after absorbing considerable punishment from opposing defenceman and netminders. 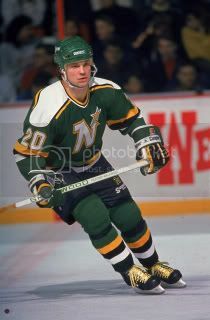 In March of 1989 Ciccarelli's successful run with the North Stars was over. He was traded along with rugged defenseman Bob Rouse to the Washington Capitals in exchange for sniper Mike Gartner and scoring defenceman Larry Murphy. 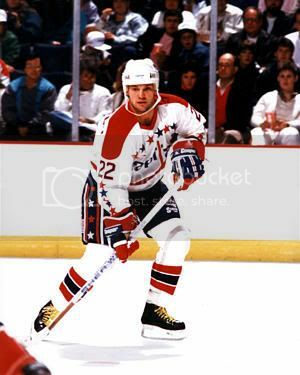 With the Capitals Ciccarelli continued to play his gritty style of game and scored consistently, however, Washington's repeated playoff failures caused Capitals management to make some changes and Ciccarelli was dispatched to the Detroit Red Wings in the summer of 1992. The Red Wings were a club with lots of scoring talent, but they lacked a top forward with Dino's grit and tenacity. Ciccarelli was an instant success in Motown scoring 41 goals and 97 points. In 1995 Ciccarelli made his second trip to the Stanley Cup Finals and delivered 9 goals that finals, but the Red Wings fell to the New Jersey Devils that spring, a team that also featured his old teammate from his North Stars playing days, Neal Broten. With his point totals shrinking and the Red Wings looking to re-tool for a serious run at the Cup Ciccarelli was traded to the Tampa Bay Lightning in the summer of 1996. With the Lightning Dino played the role of the wily veteran, and bounced back with a 35-goal and 60 point season, just two off of the team lead. But despite his success, the team still floundered in the standings and Dino was traded cross-state to the Florida Panthers during his second season in Tampa. Now clearly in the twilight of his career, Ciccarelli was brought in to help push the Panthers, who had been surprise Stanley Cup finalists just two years before, to the next level. Though the Panthers didn't make the playoffs that year, Ciccarelli reached a personal milestone scoring his 600th career goal. His final season came in 1998-99, a year that Ciccarelli was limited to just 14 games due to chronic back problems. At season's end, the Panthers released Ciccarelli. With a career of cross-checks finally catching up with his back, Ciccarelli retired ranked 9th in league history in goals scored. This total is even more impressive when you factor in that Ciccarelli was never even drafted. Due to a broken leg suffered as a sixteen-year-old, Ciccarelli was passed over in the NHL entry draft and joined the league as a free agent signee. Dino is considered by many to be one of the best players in league history to never have won a Stanley Cup. The closest he came was in 1995 with the Detroit Red Wings, when they were beaten by the New Jersey Devils. Ciccarelli's career was overshadowed by several controversial moments, both on and off the ice that followed him throughout the league. In 1987 he pleaded guilty to indecent exposure and received probation, after supposedly retreiving his mail with no underwear on in Edina Minnesota, an affluential Minnesota supburb of Minneapolis. Then on January 6, 1988, in a game played at Maple Leaf Gardens, Ciccarelli attacked Maple Leafs defenseman Luke Richardson with his stick. As a result of this incident, Ciccarelli was convicted of assault, fined $1000, and sentenced to one day in jail. After retiring, Ciccarelli allegedly had several physical altercations with members of the media. Some have criticized the HHoF for focusing on issues other than hockey for his exclusion, but others point out that the induction committee has maintained such integrity in order to avoid tarnishing such an honour. Ciccarelli returned to the game in his post playing career purchasing the Sarnia Sting of the OHL along with his brother Robert in 1994. Throughout his career Ciccarelli played over 1,200 games and finished with 608 goals and 1,200 points. Ciccarelli's number 8 was also retired by his junior team, the London Knights. Dino also owns a nightclub called "Club 22" in Shelby Township, Michigan where he now resides.